Why should we work together on creating your own podcast and digital marketing brand? Your entire professional career has prepared you to create unique digital content separating you from your competitors. Answering the questions you’ve heard from your clients in audio and video form will help build rapport faster, you will spend less time convincing them to do business with you, while helping more potential clients find your website content through search engines and the most popular podcast channels. Our experienced podcast production team is headquartered in Indianapolis, Indiana. We have clients in Indianapolis but we also have clients across the country. Whether or not we’re producing in one of our audio and video studios, we can also consult on how to set up your own podcast recording equipment in your home or office. You choose how much you want to manage in the podcast production process. Most of our clients want to record in one of our studios then we manage all the in session and after session production. Our clients outside of Indianapolis are typically recording their commentary and guests’ audio then sending us the raw media pieces for our team to manage all the post production. We’re trusted to provide the professional video and audio production to create your dynamite custom podcast. 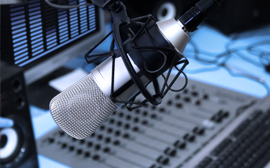 Our team has been on air hosting and producing audio imaging since the late 1990s. We’ve coached on air and podcast host talent, we’ve written short form and long form scripts for radio shows, podcasts and video content. We are open and honest that we’re not video production specialists. That’s why we have long time professional partners to record video in studio or out of studio for a comprehensive new media approach. How Do You Plan Out Your Podcast? We consult on new podcast concepts, sometimes our clients want to run ideas by us to see if they should spend the time to start a new podcast. If it makes sense for both sides, we’ll help build your podcast strategy and production from the ground up, or enhance your current podcast and video content through our talent coaching and creative production services. You don’t need to have a weekly 1 hour show to impact your target audience, while growing listeners and new leads. Effective podcasts vary in total time. Whether your podcast has the purpose of being a consistent resource, to entertain or provide an ongoing narrative, our passion is to help shape the show outline, help script it, consult on hosting, who you bring on as guests and how to approach the overall audio sound and video presentation. We work with clients who have their own in home or in office studio, we also have professional audio and video studios our clients use where our core team is headquartered in Indianapolis, Indiana. Whether you’re in Indianapolis or another state, we’d love to collaborate on your new media production. Our typical first step is a discovery phone call or in person meeting to run through conception, intake and the next steps process. Contact us online or give us a call at 317-402-1224.